Despite its wealth of Verdi’s beautiful music, Piave’s complex and convoluted libretto for Rigoletto remains a difficult work to realize on the stage with any sense of dramatic credulity. Rampant misogyny, ingrained superstition and the role of the buffoon compete with murder, torture and blackmail for attention in a crowded and (to a modern audience) sometimes unclear plot. In this new production by Opera Australia, receiving its premiere in Melbourne, director Roger Hodgman has abandoned the trend of updates which characterize many other productions in favor of a return to the original setting in medieval Mantua. His collaborating designers have produced a glowering set of stone walls, dark alleyways, buttressed palace or cathedral walls and flaming torches. Fire in fact features regularly as candelabra, braziers and street lights pierce the darkness with pools of illumination. Costumes were in a limited palette of reds and browns but with the Duke cutting a less dashingly attractive figure than we might have expected. This threateningly dim and oppressive environment and the decision to light the entire opera as night heightened the darkness of the mood at times but also inhibited the realization of the plot in that characters seemed stilted in their actions which did not assist the telling of the story or the understanding of the many moods of the opera. There was a lack of stage “business” which made some of the chorus scenes awkward with little to do other than stand about in groups. The final scene of Act One in which Rigoletto is tricked into assisting in the abduction of his own daughter lacked dramatic intensity because of this. Orchestra Victoria was under the direction of Renato Palumbo whom we last heard in Melbourne in 2013 with Aida. There was some beautiful playing especially from the strings. He conjured the many colors of the score into a lively and sometimes rapid performance but on occasions produced some variations in the tempi which were hard to follow. Overall, it was a strong performance from the orchestra and this Melbourne ensemble continue to produce creditable and rewarding renditions. 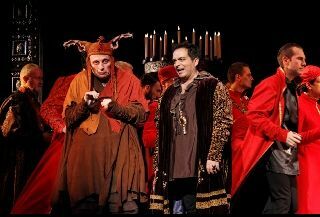 Baritone Warwick Fyfe knows this role of Rigoletto well having performed it many times both locally and abroad. His is a brooding character of vindictive tongue-lashings and vitriol. He weaves among the crowd looking for weaknesses and exploiting them for his own advantage. His attachment to the Duke is purely monetary – this Rigoletto is loyal to no one other than his daughter. As we saw in his realisation of the role of Alberich during the Melbourne Ring Cycle in 2013, Mr Fyfe’s vocal range is as exemplary and commanding as his acting. He has a hugely impressive repertoire of dramatic capabilities but it seemed that in this production, he was limited to a static pose reminiscent of retro productions. This notwithstanding, Warwick Fyfe’s performance in the title role produced many moments of great beauty and touching emotion. His denunciation of the courtiers in Act Two was a powerful moment in the drama and his reduction to tears and pleading in this same scene produced elements of intense passion. The audience acclaim at the end of the performance was evidence enough of a spectacular night of singing. Equally impressive was the crystal accuracy of Russian soprano Irina Dubrovskaya. Her "Caro nome" was exquisitely phrased and impeccably delivered as was her entire performance. Her acting embodied a childlike innocence which was entirely believable and in this sense, her performance musically and dramatically was the stand-out of this production. Most notable were the exciting and breathtaking trills she is able to produce and this is a role which allowed her to show off a dazzling range of techniques as well as her laser-sharp pitch. Italian tenor Gianluca Terranova was a surprisingly understated Duke. His singing is accurate but his stage presence was not that of the captivating roué the plot suggests. His vocal delivery in Act One was restrained and it was not until the final act that we heard him at his best with the Act Three Quartet perhaps his best music-making of the night. Sparafucile was sung by Daniel Sumegi whose glorious bass lent a luxurious element to the roughness of the hired assassin. Maddalena was marvellously sung and acted by Sian Pendry. Her voice is richly nuanced and her stage presence was varied and cleverly paced to enable her to develop this minor character role. The singing from Opera Australia’s Chorus was good. They cultivated a sound which was an accurate reading of the score. Opera Australia has a strong choral presence and in this work we heard the depth and strength of the men’s voices beautifully displayed. Again however, the staging left many of them standing about looking as though they were in need of further direction. Overall, this Rigoletto received a strong response from the near-capacity audience. It is a new production which will no doubt evolve and develop with repetition. The quality of the singing was high and the two characters of Rigoletto and his daughter Gilda were excitingly delivered by Warwick Fyfe and Irina Dubrovskaya.